Secretary’s Day 2018 isn’t simply for those who carry the ‘secretary’ in their job title. Many people who are responsible for any administrative tasks and also known as ‘supportive staff’ deserve to be shown appreciation with flowers on secretarys day. Whether this super hero of the work place is male or female we have the gift for secretary’s day to suit! There are many ways to thank a person, but when it comes to flowers for colleagues and secretarys day, you’ve really got to pull out all the stops. Nothing says thank you like a fresh bunch of flowers. Order a spectacular bouquet of gerberas and roses for secretarys day to put a smile on your PA’s face. 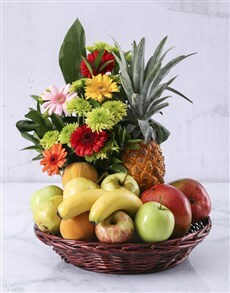 Your PA might be immune to rude telephone callers, but she can never resist this temptation snack and flowering plant hamper. Chocolates, nuts, dried fruit and a very little flowering plant of their own – who could complain this Secretarys day with this gift? The typical office desk is often filled with bland trays of papers, ugly leaver arch files and maybe the odd cute family photo or an inspirational quote stuck on the edge of a computer screen. Spice up their desk on Secretary’s Day with this practical and pretty arrangement of gerberas in a pail. Is your right hand woman or man the resilient, hard worker of the office? Give them something this secretaries day to reflect their commendable resilient, no nonsense attitude; a miniature cactus in a glass jar. For all the many times the work day became just that much longer because of last minutes and oops I forgots, it’s time to thank them. 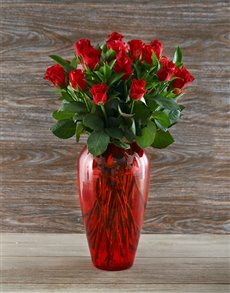 And what better way to score brownie points than with gorgeously bright flowers in a glass vase your secretary, ready to pop on their desk. Like all the brilliant plans he or she might have come up with, (i.e. the time they rearranged your diary so that you didn’t have to cancel dinner with the wife) we have a few tricks of our own. NetFlorist creates delicious chocolate flower arrangements, like this blooming chocolate edible arrangement; perfect for that secretarys day celebratory gift. For all the days of the year that your secretary, pa, receptionist and anything in between supports you and your business, there’s one day made for showing them a bit of support. Treat them and make it a memorable one this Secretary's Day September 5, 2018, with our delicious goodies and fresh flowers for secretary’s day.